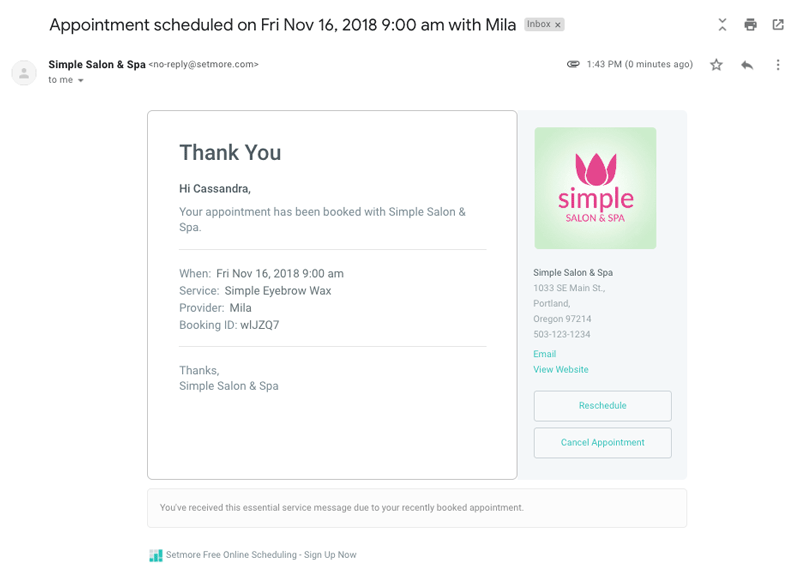 Scheduling appointments is Setmore’s bread and butter. But a smart online booking calendar needs more than just a way to book with customers. 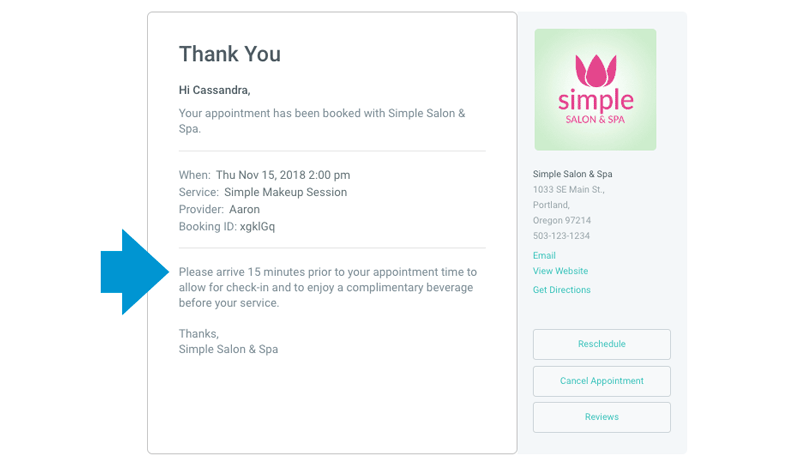 It needs a way to engage customers, and keep them informed about the appointments they book! Alert and remind your staff about new, rescheduled, or cancelled appointments. In this series of blog posts, we’ll provide an in-depth look at the how-to, benefits and limitations of Setmore’s automated messaging system. Today we’ll start with email confirmations and reminders. You can expect to read about text reminders and staff notifications in future posts. The Reschedule/Cancel buttons (not activated by default) appear in the bottom right corner of the email template. They allow the customer to reschedule or cancel an appointment online, without having to call you. Customers can reschedule or cancel up to the “Cancellation Window” as specified in your Booking Policies. Navigate to Settings > Notifications > Customer. Under “Appointment,” check the box next to “Booked” to toggle confirmation emails on or off. Check the box next to each add-on feature, such as .ics attachments, to toggle them on or off. Note: Email settings are not available from the Setmore mobile app. To change your email settings, log into your account at https://my.setmore.com. Under “Appointment Reminders,” check the box to toggle reminder emails on or off. Under “Reminder Lead Time,” use the drop-down menu to set the lead time in days, hours, and minutes. Pro tip: We recommend a reminder lead time of either 1 day, or 1-3 hours. Experiment to see which works best for your customers. Every so often you might have a customer who doesn’t receive an email reminder. You can check the status of an email reminder by opening the Appointment Details window for any given appointment, from your admin calendar. Navigate to Settings > Notifications > Customization. Enter a custom sender name in the “Sender Name” field, then click anywhere outside the field to save your changes. Enter a custom signature in the “Email Signature” field, then click anywhere outside the field to save your changes. Pro Tip: Want to give customers an easy way to respond to your automated email alerts? The email signature would be a great place to post your Live Booking phone number. Setmore plans to expand the functionality of email alerts in the future. For the time being, there are some limitations you should be aware of. Emails and texts are “do-not-reply” – If you want customers to be able to respond to an email alert or reminder, be sure to include instructions for how they can reach you in the custom email signature. Customers can’t reschedule or cancel class sessions – The “Reschedule” and “Cancel” buttons won’t appear in an email confirmation or reminder for a class session, even if you have the option enabled. Email settings aren’t accessible via mobile – As previously mentioned, you can adjust your email alert settings by logging into Setmore at https://my.setmore.com. Setmore doesn’t support mass marketing – This might change in the future, but we don’t currently support the ability to send a mass email to your customer list. If you do email marketing, you might be interested in our MailChimp or Constant Contact integrations. Now you’re a pro when it comes to using Setmore’s automated email system. Stay tuned for the next chapter on Text Reminders, which are twice as effective as email reminders. Have questions about customer notifications and reminders? Post a comment below and we’ll help you out. *Based on internal Setmore marketing statistics, 2018. The only thing i have not liked about Setmore is the limit on my communication for giving information to clients with their booking. I hope that continues to enlarge. Referring to what is mentioned above, “Alert and remind your staff about new, rescheduled, or cancelled appointments”. How will the staff receive the alerts? Os it emailed to a certain email? How do you customise it? Hi Maroulla, good question. The focus of this post was on customer-facing emails, we’ll cover staff emails in a later post. But to answer your question, most of the settings for Staff email confirmations and reminders can be found under Settings > Notifications > Staff. To help improve the experience for staff members who are using activity alerts, we also recommend downloading and using the Setmore mobile app, which will give you push notifications for new and rescheduled appointments, and reminders as well. We’ll cover all this more in-depth in the next few postings. In the past we had this enabled but almost immediately disabled it, Most if not all of our appointments are multiple services chained together (which setmore treats as separate appointments for the same client, when doing this clients would receive multiple emails about their appointments and potentially multiple updates if anything was changed, this was completely unacceptable, can I ask if this has been fixed? I noticed the same issue. I was able to alter the notification settings to only send an email when the booking was made and not if I edited it. Not sure about the multi services chained together piece. If a customer books a bundle of services, and you edit just one service, Setmore should only send out one “Rescheduled” email notification. It has to do with the way Setmore treats bundled services – as a batch of individual appointments, rather than one big appointment. In the future we may prioritize rebuilding this feature to more closely reflect the reality of the situation (one customer coming in for one appointment with multiple services), but I can tell you it won’t happen soon since we’re engaged with other projects. Hi Wayne, unfortunately no, the automated email system isn’t optimized to work with bundling multiple services. In your case it won’t work very well, I’m sorry about that. There are plenty of ‘nice to have’ features I would like to see, like the iPad app or landscape mode for example but the way Setmore treats multiple services for a single appointment is actually the biggest issue I have with the application, would love to see this on the next roadmap. The only other way to do this is to create bundle service which could become quite messy. Hi Sara, when editing the signature form field, you have to click outside of the form field to save your changes. If you close the browser tab while the signature form field is still active, changes won’t be saved. If you are clicking outside the form field and see a “changes saved” message in your browser, and your edits still aren’t being saved, this could be a system bug and we should look at some other factors. What browser and operating system are you using? That’s the first place to start looking. 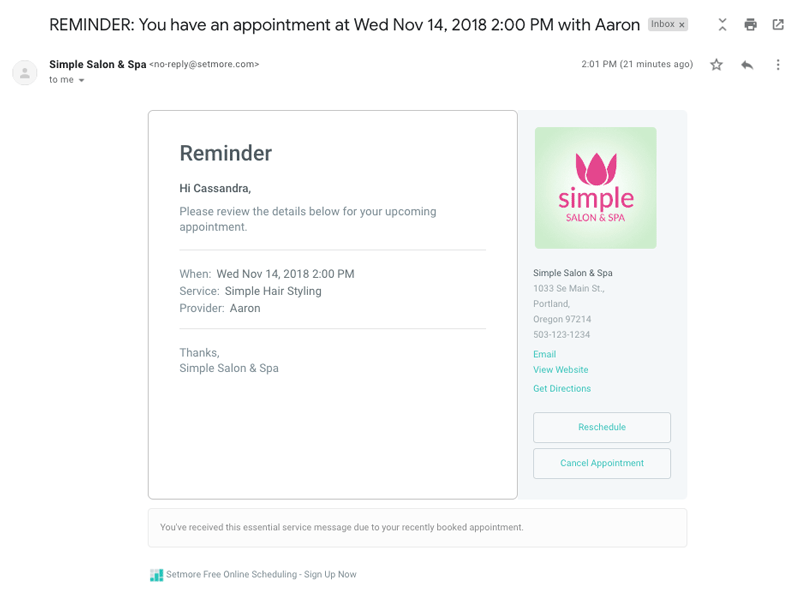 I would love to have the ability to have an automated email sent the day after (or what have you) the booking, just as the reminders can be sent. This would be useful to be able to say “thank you!” and share a link to a satisfaction survey.